There was a time when asset management was, by nature, a time-consuming process. Inspectors had to pick up their job assignments at the office, and then bring their forms back at the end of the day with a pile of paperwork, including timesheets and repair request forms. Now, there’s a better way. By going mobile, your company can save time, money, and resources while supporting a more robust data output resulting in longer asset life. You can capture data more fully than ever before while reducing errors, improving compliance, and collecting an auditable data library in real-time. Mobile workflows are revolutionizing asset management. If you’re ever wondering just how powerful mobile form solutions can be for asset management, just ask Jason Bloch, the Inspection Manager at Tanknology. Going mobile helped his team quadruple the amount of inspections it carries out each month and improve customer satisfaction, while still decreasing the hours spent on administrative tasks in the office. By completely eliminating paper forms, along with the time and cost of printing, delivering, and processing them, teams save time and money while still collecting more valuable data. 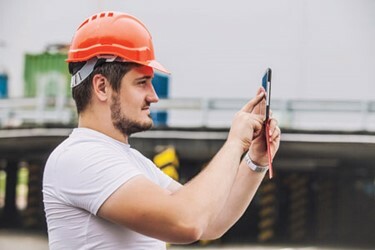 Digital forms also enable teams to capture rich data, from photos to audio recordings, timestamps, and more for greater visibility in the field. Technicians also file data in real time from the field – and if you’re offline, it will automatically be submitted as soon as connectivity is restored.